Tabletops inlaid with wolf mascot logo. Enclosed trash units just like McDonalds™. Cluster seating units with swivel seats. Booths with sparkle metalflake glitter finish. 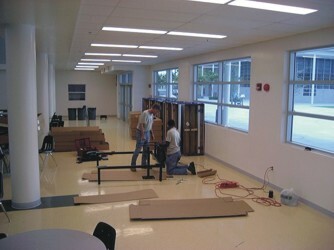 Before: This is a brand new high school and they wanted to create a food court look. Boy did it work! 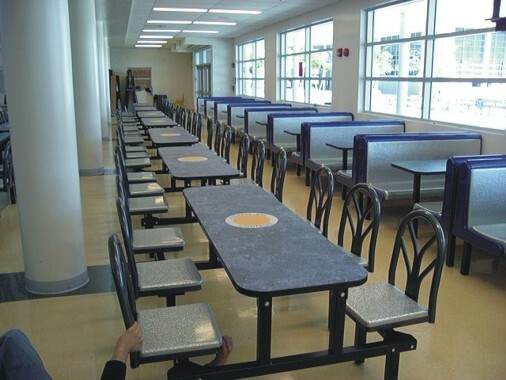 After: The kids enter the cafeteria, run to reserve these booths and cluster seating units, drop their book bags and then go to the serving line!